Compact point-and-shoot cameras definitely have a use for almost anyone – travel, real estate, family events, art, news, law enforcement, and so on. They can be perfect when a large beginner-level DSLR is too much. These are the 10 best digital cameras under $200 for 2018. Many of these cameras contain some sort of image stabilization, helping you get crisper images when you’re handholding shots in low light. All of them have fantastic automatic shooting modes, and include features such as macro, face detection, and panorama. These cameras are perfect for travel, and you’ll even find two compact waterproof cameras under $200. Before we get started, one specification you may want to pay attention to is the optical zoom. Small zooms aren’t quite as versatile as bigger zooms. 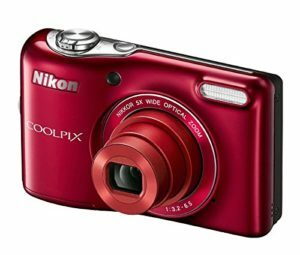 Some of these cameras also have large digital zooms on top of the optical zoom, but remember that a digital zoom will decrease image quality. Note: Another design feature inherent in small cameras is the image quality in low light. Many small sensors have difficulty in low light, though some of them feature special technology to assist with this. 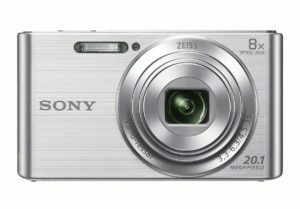 Sony’s Cyber-shot DSC-W830 is a great camera for people who don’t want to think too much about the technical aspects of their photos. The camera is roughly the size of a billfold and easily fits in your pocket with a low profile. The W830 has multiple intelligent auto modes that can detect what kind of scene your shooting, including portraits, and adjusts the settings appropriately. It can also record 720HD movies at 30 frames per second. The bright 2.7” LCD screen helps when you’re editing photos in-camera: adjusting skin tones, whitening teeth, and sharpening photos. This camera has an 8x optical zoom that can be multiplied with 64x digital zoom, but quality will really start to suffer after that. The camera is also not sealed from the elements. Many reviewers all say that this is a great camera for the price. Getting a Carl Zeiss lens and 20 megapixels in a package this small is a deal. The buttons are easy to use, however the menu system can be a bit complicated. If you really want to get to know your camera, you may have to spend some time figuring it out. Battery life is good and the camera is great for everyday snaps. It doesn’t perform well in low light, however; so, you may want to reserve it for daytime. The panorama mode works very well and is fun to use. The DSC-W830 features Sony’s Optical SteadyShot, a feature more commonly found in higher-end cameras. This feature works very well and assists greatly in getting sharp images. The auto modes work very well, especially face detection. This camera can remember eight faces, so if you’re taking a picture of a family member in a crowded area the camera knows to look for the face it recognizes when focusing. Focus distances are just less than 2”, but you have to be in wide zoom for this. The 64x digital zoom won’t be necessarily useful at the high end, but the 8x Carl Zeiss Vario-Tessar optical zoom is an impressive feature for a camera this small. Low light performance leaves a lot to be desired. The maximum ISO is 3200, but there is a lot of noise at this setting. A faster lens could alleviate some of this. If you purchase an extra battery for this camera, you’ll have to charge it in-camera. Offering in-camera charging is important with a camera this small, but an external charger would have been a nice feature. The BIONZ processor isn’t speedy in this camera. Photos seem slow to write to the memory card, and the camera shoots a slow one-picture-per-second. Nikon’s latest L-series COOLPIX, the L32, is a handy, easy-to-use camera just slightly larger than the size of a smartphone when a smartphone won’t cut it. Or, for those times when you can’t take your large camera body, but need a better camera with you other than a smartphone. This camera is powered by two AA batteries, great for people always on the go. 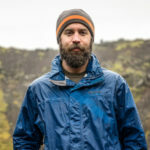 Other features that make this an easy camera to use are its multiple intelligent auto shooting modes, scene selection, and the Smart Portrait System. The Macro system works great for getting close-up photos of smaller objects. This camera will also record 720 HD videos at 30fps. Don’t expect to get great low-light performance out of this camera, though. The maximum ISO is 1600. It does have vibration reduction for longer shutter speeds, but the image quality at high ISO leaves some room for improvement. The L32 has a great focal range, from wide to zoom, allowing people to get a good variety of shots. It’s a great alternative to when you don’t want to take the big camera. The camera is a great value for the price, especially if you don’t want to venture into the next price bracket of cameras under $300. However, there have been many reports of the camera not lasting too long – just a couple of years before it has to be replaced. However, it’s cheap enough that most people feel they get value out of it. The flash can be inconsistent and is underpowered. Auto settings don’t seem to be dialed in. Otherwise, this is a great camera for people who just always need to carry a camera in their pocket when their smartphone isn’t enough. Such as: appraisers, contractors, etc. Powering this camera with AA batteries instead of a specialty lithium battery makes this camera very convenient for travelers who can’t find a way to charge a battery on the go. The electronic vibration reduction system works very well, and considering the ISO and maximum aperture aren’t very fast, this greatly aids in getting sharper photos in low light. For those who don’t want to mess around with smartphone apps or computer editing software, this camera has a built-in Smart Portrait System. This gives you the ability to soften skin, remove blemishes, and it also fires the shutter when the subject smiles. The low ISO of 1600 is won’t give you much in low light. It’s difficult to ask for much more with a camera this cheap, but you’d think minimum modern standards would be better than this. Don’t expect stellar performance in low light. The only notable problem with this camera’s construction is the battery door – it doesn’t secure very well. Other than that it’s a good build. However, the camera feels very fragile. There seems to be a trend with many digital devices not coming with a paper instruction manual anymore. This does save resources, but it can be frustrating to people who just want to quickly reference one function. 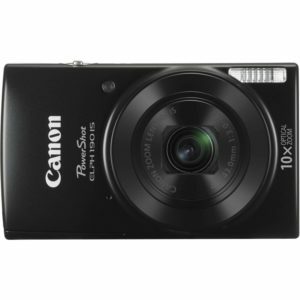 Canon managed to fit a lot of great features into the little SX610HS compact camera. The big features are the 18x optical zoom coupled with a smart image stabilization system. Pictures coming out of this camera are clear and sharp. There are some special modes that make using this camera fun. Hybrid Auto will make a highlight reel for you by recording four-second clips every time you press the shutter for a photo. There are also dozens of Creative Auto modes to get you the look you want. Compact cameras are hard to hold and hang on to – this model features a small rubber strip on the grip to help with that. Just note that you won’t be able to charge this camera with a USB cord – and that is a common complaint. This is a great pocket camera. Photographers who also shoot budget DSLRs have mentioned that this camera has some amazing image quality for a camera of this size. There are a number of buttons on the back of the camera that make control easier than attempting to navigate multiple menus. The buttons are small though, so you have to pay attention to where you’re pressing. It does shoot 1080HD video but it’s not a lot to get excited about; sampling rates are poor, leading to low quality. The pictures also tend to be very bright indoors, flash or no flash. The SX610 HS manages to pack quite a long lens in a package so small. The 18x optical zoom maintains clarity throughout the zoom range for clear photos, even at the maximum range. You’ll want a stable camera at that range, and the Intelligent Image Stabilization fills that role with 8 different stabilization modes. The big, bright 3” LCD screen makes composition easy. You can also connect this camera to your smartphone via Wi-Fi, enabling remote camera control and image transfer. This camera has a great noise reduction mode for clear shots in low light, up to ISO 3200. It’s also fast, capable of shooting at 7.2 frames per second. This is almost seven times as fast as other cameras of this size and price. One of the biggest shortcomings of this camera is the need to charge the battery with a wall adapter. Most modern cameras allow charging in-camera through a USB cord. You will need a wall outlet to charge this one. The flash does not automatically pop up when flash is required, you must manually pull it up. And, like most cameras, push it back down. 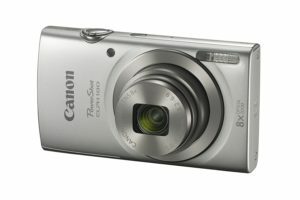 Canon removed the mode dial from the top of the camera and moved those functions to the small buttons on the back. Switching modes will be slightly more inconvenient with this method. The Canon ELPH 180 is a wonderful camera for both beginners and advanced photographers. The interface is very intuitive and easy to use. 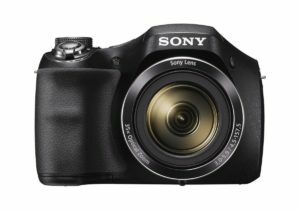 This camera features a useful zoom range with the 8x optical zoom and creates some very sharp photos. Many Smart AUTO modes make use of the DIGIC 4+ processor to accurately apply the proper settings to your scene. The processor can handle shooting up to 2.2 frames per second. You can also record 720 HD video at 25fps. This camera features image stabilization as well, but the stabilization is done digitally and this crops the image. Realize that when this is happening, your pixel count may be lowered. You also won’t be able to charge or transfer photos via USB – this can be a deal breaker for some. ELPH 180 users like the simple menu structure and find this camera easy to use. There aren’t a ton of buttons or options to get lost in. Most photogs who uses this camera compliments the image quality. Images are crisp and clear, always in focus, and at all extremes of the zoom range. Some photographers have mentioned that they’d love to see a stronger flash on this camera. The ELPH 180 won’t throw light very far at all, so make sure your subject is well-lit. 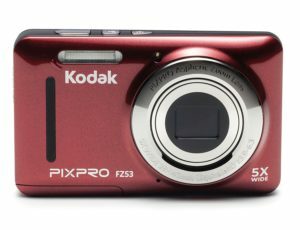 Many users have been frustrated by the fact that this camera can’t be connected to a computer for image transfer; the memory card must be plugged directly into a computer. This camera has a number of Smart AUTO modes that analyze the scene and then apply the proper settings. It works very well and is great for photographers who don’t want to have to think about settings. The capabilities of the lens are also good for a camera this small. The maximum aperture of f/3.2 makes it one of the brightest lenses in this price range. Macro mode also works very well, focusing as close as 1cm. Canon has hit the right combination with size and interface with this camera. The menus and buttons are foolproof. The maximum ISO could use a boost up to 3200, but the f/3.2 lens makes up for this. One of the big drawbacks of this camera is the interface, both with the battery and the memory card. The battery must be charged in a wall charger and cannot be charged via USB. The memory card must also be inserted directly into a computer; the camera can’t be connected via USB. Finally, if you have this camera on a traditional or travel tripod, you won’t be able to access the battery or memory card. On the topic of the battery, the battery door needs a better design. It is hard to close and keep closed. This is common with many of the compact cameras. It’s nice to see a weatherproof, freeze proof, shock proof camera on a list of cameras under $200. These qualities make it an ideal shooter to stash in your camera backpack for travel to the tropics, hiking in snow, or any other conditions you wouldn’t want to take any other camera. There isn’t a lot of optical zoom with this camera due to housing limitations, but some other features make up for it. Panasonic was able to fit five-axis optical image stabilization in this model. This is especially useful underwater where you’ll have a shaky camera in low light. The burst mode can shoot as fast as 8 frames per second. You can not only record 720 HD video, but you can also take still photos while recording video. It’s easy to get overwhelmed with all of the features of this camera. It takes users time to familiarize themselves with this camera. The instruction manual is long and not written very well. Lumix DMC-TS30 users all feel a great peace of mind when using this camera. Because of its rugged, protected design you won’t have to put all of your concentration on protecting your camera. The picture quality, however, is average. The menu is very clear and intuitive to navigate. Just be careful when holding the camera as some photographers have managed to accidentally put their fingers over the flash lens port. 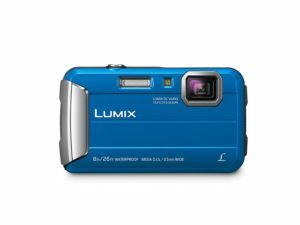 It’s fun to have a camera in this price range offer all of the features of the Lumix DMC-TS30, notably the environmental protections. The camera is waterproof up to 26’, shockproof, freeze proof, and dust proof. It also has a small illumination light for underwater photography. This camera features a number of useful modes, including panorama, time lapse, and underwater. The underwater mode will correct for the green tint common in many underwater photos. One nice touch on this camera is the built-in overflow memory. If you fill up your card underwater where you can’t change it out, you’ll have 220MB of overflow in the camera. There isn’t anything special about the 4x optical zoom – it’s rather low. However, this should be expected for a compact waterproof camera. It’s difficult to design much more capability in a small space. The safety latch for the battery compartment has a poor design. There have been a number of users who have had water intrusion due to the latch coming open underwater. This doesn’t happen often, but it’s a big design flaw. Panasonic usually has great optics, but the image quality in this camera is just average. This camera has some impressive capabilities, but at the expense of sharp, clear images usually found in other Panasonics. 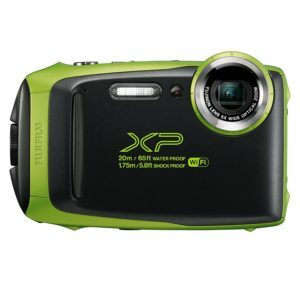 Fujifilm releases a new model of their rugged, XP series of waterproof cameras every year. The XP120 has already been succeeded by the XP130, but the XP120 is more affordable and still a very relevant camera. You’ll be able to take this camera on dives down to 65’ and utilize the Underwater and Underwater Macro modes to get great, sharp photos without the green tint. A 5x optical zoom is augmented by optical image stabilization, especially useful underwater where you can’t steady the camera with anything. Other shooting modes include Time Lapse, Panorama, and Cinemagraph, a fun mode that creates a video with some elements moving and others static. You’ll be able to record 1080 HD video up to 60fps and shoot in bursts up to 10fps. The Fujifilm XP120 isn’t just an underwater camera, it’s also great above land. There is a good water repellent coating on its lens port. This keeps water from sticking as you transition from underwater to above water. The camera is affordable and simple to use. All controls are on the right side of the camera, and one-handed operation is easy. Good for when you need your other hand to steady yourself underwater. The choice of colors for the camera body is nice – not just for personalization, but also to be able to easily spot your camera after setting it down. The XP120 is packed with useful features. It’s waterproof to 65’ – great for a compact camera of this price – freeze proof, shockproof, dust proof. The image sensor is illuminated from the back, which helps it gather light and makes it more efficient in low-light situations, like underwater. This decreases the amount of noise you’ll see in the picture. Operation is simple with the convenient controls, the bright 3” LCD screen, and Wi-Fi will let you quickly transfer photos to your smartphone. Underwater and Underwater Macro modes will help you get close-up photos underwater with sharp focus and accurate color. This camera doesn’t have a lot of areas on which it needs to improve. Fujifilm releases a new model of this camera every year and is constantly improving it. With that said, sometimes it shows inconsistency in properly focusing underwater. The contrast detection needs a boost in underwater situations, so make sure you have proper contrast when focusing. The battery door contains a sensor that tells you if the door isn’t closed. Sometimes this faults, preventing you from taking photos. Cycling power usually fixes it. The ELPH 190 builds on the highly-reviewed ELPH 180 released earlier. The 190 has the same 20MP sensor as ELPH 180, but it has a better lens – the 190 now features a 10x optical zoom instead of 8x, and a slightly faster aperture of f/3.0. This camera also now incorporates Wi-Fi. This was supposed to address frustrations of not being able to transfer photos directly from the camera to a computer. Many users have had problems connecting, but when it works – it’s a great feature. You can record 720 HD videos at 25fps and shoot still photos up to 2.2 frames per second. This camera also has the Smart AUTO modes and Intelligent Image Stabilization that make using this camera a breeze. Just like its predecessor, users rave about the clear, sharp pictures coming out of the ELPH 190. It’s another small, high-quality camera that even more serious photographers always have with them just in case. The battery has a long life, especially with ECO mode. The flash is also fast to cycle, though slightly underpowered. A number of users have had problems with the Wi-Fi introduced in the ELPH 190. The manual has poor instructions for setting up Wi-Fi connections, and the camera itself seems to have difficulty connecting to a computer. A number of users have spent a lot of time with Canon support. The ELPH 190 features the same Intelligent Image Stabilization as the ELPH 180. The camera does a good job of figuring out which one of eight stabilization modes would be best for the situation. The camera is easy to use, and just in case you get stuck it features a Help button. Information will come up on the screen to help you with each feature. Wi-Fi also has its own dedicated button, making transfer faster. This camera also features a great Macro mode, which can focus as close as 1cm in wide angle. And, like the ELPH 180, this one also features the same great Smart AUTO modes. This camera still has a relatively low ISO of 1600. The maximum aperture increased just slightly, but not enough to make a notable difference. Like the ELPH 180, the battery on the 190 can’t be charged in-camera; you’ll need to remove it and plug it into a wall charger. If you have this camera on a tripod, you’ll also need to remove it to access the battery and memory card. The Wi-Fi functionality of this camera seems to have been introduced before it was ready. Suffice to say, there are a number of bugs involved. With that said, there are still many users who have never had a problem with connectivity. The Sony Cyber-shot DSC-H300 looks more like a traditional DSLR, but it’s a very affordable point-and-shoot camera made for those looking at switching to DSLRs. Besides the normal automatic functions of point-and-shoots, you’ll also have manual control. The 35x optical zoom of this camera puts it way ahead of its competitors in this price range. It comes with a price, of course, and that’s the weight. This camera is also about four times as heavy as compact point-and-shoots, and slightly larger. 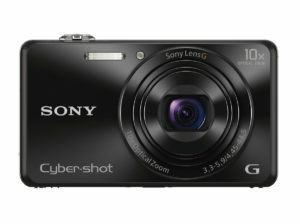 This camera features Optical SteadyShot with a fast f/3.0 lens, and digital zoom up to 70x. You’ll get great images out of this camera, but the more digital zoom you use the more they’ll suffer. In addition to stills, you can also record 720 HD movies at 30fps. This camera does take 4xAA batteries instead of a special rechargeable battery. Take that how you will. Photographers have fun with this camera, noting that it’s very easy to use and takes great photos. It is even in use by news and law enforcement, a great option when a compact isn’t quite enough – but a DSLR is too much. The camera feels solid and is well balanced. Users like being able to have more control over their photos with this camera, or just let the camera do it all. The iAuto mode does a great job. Indoor photography in low light isn’t that great, though. There is a lot of noise at higher ISOs. Some love the fact that it runs on AA batteries, others hate it. Sony’s Optical SteadyShot is essential for a camera with this much zoom, and it does a wonderful job stabilizing its photos. The zoom range is quite impressive. This camera has a number of great auto features, including Face Detection, Panorama, and Program. It also has a manual mode (if you want to give that a shot). There are more options for re-powering the camera because it runs on 4xAA batteries, but you won’t have the ability to charge in-camera. This is an ideal camera for someone wishing to make the leap from a compact point-and-shoot to a DSLR. This camera is perhaps the slowest point-and-shoot out there, and that’s rather disappointing coming from Sony. You’ll only be able to click off less than one frame per second – the specification is 0.8fps. Some love the AA batteries, others don’t. Either way – this camera eats through them quickly. The generic batteries that come with the camera are dead in a laughably slim amount of time. Images produced in low light and high ISO have a lot of noise in them – more than comparable cameras. The use of its flash is highly recommended when practical. At just under $200, the Cyber-shot DSC-WX220 may be one of the best cameras in this price range. A 10x zoom, backlit sensor, high ISO value, and Optical SteadyShot will help you get great images and in low light. The lens is perfect for getting clear images and autofocus is fast & precise. You can record 1080 HD video at 60fps for slow motion, and record still photos at up to 10fps. The Wi-Fi will let you control the camera remotely and let you easily transfer the photos to both your smartphone and computer. That is, if it works – I’ve seen some reports from a few people that there are some bugs in that system. This is a fast camera and you won’t have to worry about missing the shot. Everyone is impressed with the speed of this camera. It starts up fast, has no lag between the time you press the shutter to when the photo is captured, and can shoot up to ten frames per second. The zoom can be difficult to control though. The switch is touchy and you may end up overshooting your desired focal length in both directions. The camera outputs great images with accurate color, clarity, and focus. Professional photographers have great things to say about this camera. They too are most impressed with the speed and autofocus. A 10x optical zoom is quite impressive for a camera this small, and Sony’s famous Optical SteadyShot will help keep the images clear, especially at high zoom. This camera also performs very well in low light, a function of the image stabilization, a high ISO, and the backlit EXMOR R sensor. A backlit sensor is commonly only found in higher-end camera, and it greatly increases the sensitivity to light. A number of photo modes are available, including face detection, a smile shutter, and stabilized panoramas. The intelligent auto modes perform very well in various situations. This is a fairly advanced camera, and it would be wonderful if it had some sort of manual control for those who wanted it. Everything is controlled automatically. Wi-Fi can be difficult to set up and many people have had problems with it. Related to that, Sony’s Play Memories computer software seems like an afterthought. The software is buggy and difficult to use. This camera is mostly intuitive to use, especially to those who have experience with similar cameras. However, those who don’t may find the online manual difficult to reference. The camera doesn’t come with a paper instruction booklet. Kodak is still making more than film. 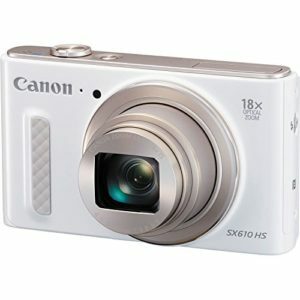 Their line of small, easy-to-use compact cameras are popular among travelers, children, parents, and even professionals. Available in 3 colors, this little camera is less than $100 – a true budget pick – but contains premium features, such as image stabilization, HD video recording, and multiple automatic shooting modes including various portrait functions. The battery can be charged in-camera, but because it’s so small it doesn’t last long. You can expect to get approximately 200 shots out of a single charge. One note about the image stabilization: keep in mind that the FZ53 uses digital stabilization, not optical, so it will crop down your image when it’s in use. The size of this camera has is advantages and disadvantages. It has a very low profile, but Kodak has tried to fit a lot of buttons on the back, so they’re all very small and close together. This camera works well in bright light but has some trouble in low light, even with the flash. It’s important to keep in mind this Kodak option is on the very-low end of affordable buys, and you likely shouldn’t expect to get extremely “strong” images in this price range. Note: This camera would not be recommended for sports or fast action. Recognizing that you can only produce a camera so good for so little cost, DSLR users generally admit this is a great camera for the price. This little camera has a lot of features. Some of the portrait features include face detection, and a blink and smile shutter. Meaning: the shutter will delay triggering until a smile is detected, or if the subject blinks. Digital image stabilization gives you a boost in sharpness when hand-holding shots. You can also record 720 HD video at 30fps. The Wide Macro mode can focus as close as 2”, giving you more capability with this camera. There are many other shooting modes, and this camera even features a manual mode, giving photographers even more control over their exposures. The lens is a little slow at f/3.9 and won’t let as much light in. This is one contributor to the camera’s poor low-light image quality. Kodak could improve on their Auto modes. Some people have noted that they prefer manual because Kodak’s auto modes are too inconsistent, and often don’t hit their target.